Rich, well-drained soil with compost dug in. A slightly acidic pH of 6 to 6.5 is preferred. Full sun in most climates. Where summers are very hot, roses benefit from partial afternoon shade. Some northern-bred roses are hardy to -40F (-40C), but most popular cultivars can be badly injured by temperatures below -10F (-23C). Choose varieties that are known to grow well in your area. Fertilize in spring by spreading a 1-inch (2.5 cm) layer of composted manure over the root zones of the plants. Feed plants again in early summer, just after the first big flush of blooms. A final feeding in late summer is needed in warm climates where many roses rebloom heavily in the fall. Plant bare-root roses in spring, just as the plants are emerging from dormancy. Container-grown plants can be set out until early summer. Mulch after planting to keep the soil moist, and to limit splashing of soil onto the leaves. Disease-resistant shrub roses need no spraying and rebloom several times during the season. 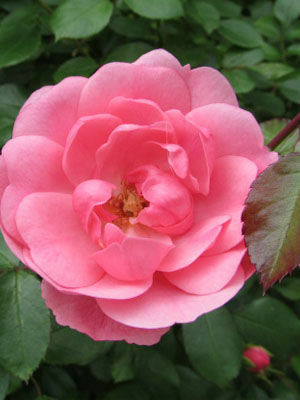 Trim back all roses after they bloom to reduce problems with disease. In some areas, a deep winter mulch is needed to protect grafts and dormant buds from winter injury. Many roses produce fleshy berries, called rosehips, that make a nutritious and flavorful addition to teas. Harvest them for drying when they turn from green to orange or red. Rose leaves and blossoms are favorite foods of Japanese beetles, but plants usually bounce back after the summer feeding period ends in late summer. Aphids are common on new growth in spring, but numerous natural enemies usually control them. Rose black spot, powdery mildew, and other diseases can be serious, and are best prevented by growing resistant varieties.